The post The State of New York State’s Legal Sports Betting Future appeared first on SportsHandle. Legal sports betting in New York could occur before the start of the next legislative session in January, but it wouldn’t be statewide. Why? Because an existing law allows for sports betting at four commercial casinos only, rather than all existing gaming entities, such as racetracks, tribal casinos, or off-track-betting parlors. The 2013 measure, which passed controversially via a ballot referendum, has caused some confusion about when, where and whether New York will join its neighbor New Jersey in allowing sports betting. The limited 2013 law has also created a situation in which the state’s gaming commission is currently moving forward with developing sports betting regulations, while on a parallel track, state lawmakers are still discussing plans to legalize statewide. A State Constitutional Amendment Allows for NY Sports Betting Only at Commercial Casinos — Not Racetracks and Other Gaming Venues. Tioga Downs, near Binghamton and Elmira, N.Y. According to the 2013 New York Casino Gambling Amendment that altered the state constitution, only the four outlets defined as commercial casinos are eligible to offer sports betting when the gaming commission rolls out its regulations. 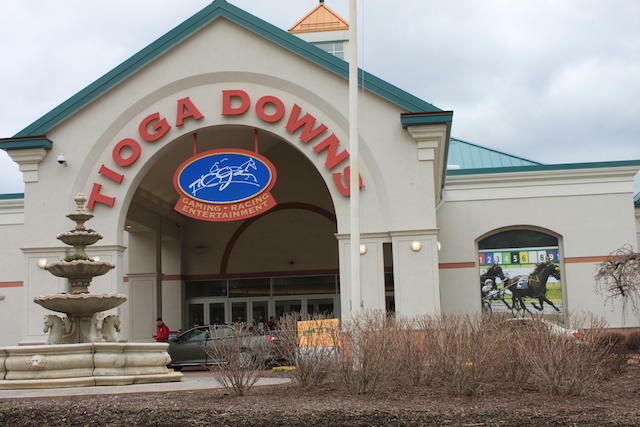 The four upstate casinos, del Lago in Seneca County, Tioga Downs in Tioga County, Resorts World Catskills in Sullivan County and Rivers in Schenectady County, are all located upstate, not in New York City. The board, according to spokesman Brad Maione, is crafting regulations. But the process will take time. Once the regulations are written, according to state law, they must first be published in draft form and then open to public comment for up to 45 days. The next step could be public hearings, depending if the board thinks those are warranted, and then the draft regulations go back to the gaming control board for revisions, if needed, then sent to the full commission for a vote and, finally published. When the regulations are published, Maione said sports betting will be taxed at 10 percent, the same rate as other gaming in the state, and no additional legislation is required before the casinos could offer sports betting. And the gaming commission will not need permission or blessing of the legislature or governor to give the four casinos a go-ahead. An Alternative To a New, More Expansive Amendment. How might something make its way onto the books in a similar fashion as the 2013 referendum? Not easily. New York is governed by a state constitution that explicitly prohibits gambling with a few specific exceptions. In order to expand on what was accomplished by the 2013 measure, lawmakers would have to create another constitutional amendment – a process that takes years and requires legislation to pass through both chambers of the legislature twice. It is just faster to draft a bill. Pretlow and Bonacic’s bills are identical and both lawmakers have publicly said they think the state should move sooner than later on sports betting. Bonacic’s term ends at the end of the year and serving in the state senate for 20 years, he will not seek re-election. “Senator Bonacic is hopeful that another member will pick up the torch on sports betting in January,” his chief of staff Andrew Winchell said. That scenario is likely as Bonacic and Pretlow have rallied plenty of support. But one key sticking point has been governor Andrew Cuomo’s apparent reticence in taking up the sports betting issue. Cuomo is currently running for re-election in November. All Four of the Major Professional Leagues Have Headquarters in New York City. When sports betting does make its way onto the legislative docket, lawmakers will have two bills that include the royalty or “integrity fee” that the pro leagues have been lobbying for in numerous states. Should New York pass a law that includes a payout to the pro leagues, it would be the first state to do so. With the NBA and Major League Baseball taking the lead, the four major professional leagues have requested a 1 percent cut off all wagers on each respective leagues’ contests, calling their games “intellectual property.” Bonacic’s bill would afford the leagues 1/5 of 1 percent on all wagers. Four of the states that have rolled out or legalized sports betting since the Professional and Amateur Sports Protection Act (PASPA) was struck down in May, don’t have any professional teams playing in their states – Delaware, Mississippi, Rhode Island and West Virginia. Legislators in New Jersey, home to the NHL’s Devils and the physical home to the New York Giants and New York Jets, vehemently rejected paying the leagues anything after bearing the costs and frustrations associated with Murphy v. NCAA, the Supreme Court case that rendered PASPA unconstitutional. While New York would set a precedent by giving the leagues a royalty, it should be noted that the Empire State finds itself in a unique situation. Many states have no meaningful, ongoing relationship with the NFL, NBA, MLB or the National Hockey League. But all four have their headquarters in New York City, providing jobs and some amount of cache for the state. The royalty or “integrity fee” fee aside, Bonacic and Pretlow are really just looking allow sports betting throughout New York, rather than at four specific locations. Of note in their bills is Pretlow’s proposed 8.5 percent tax rate on gross revenue (lower than the current 10 percent levied on other forms of gaming), making mobile/online gaming legal, and calling for the use of league-produced data in New York — the kind that gaming giant MGM recently purchased from the NBA in a private commercial agreement. Under the 2013 law, mobile wagering may not be allowed; it’s possible that patrons could place bets on their phones at the four commercial casinos, but only the bettor is physically at the casino. “When the Gaming Commission comes out with regulations, I really think you’re not going to see a heck of a lot of revenues from sports betting because it will force people to go to the lounge of the four casinos,” Bonacic said at a conference on Tuesday. So, where does New York go from here? Both parties – the gaming commission and state lawmakers – will continue doing what they’re doing. Given the timing – New York’s legislature doesn’t reconvene until after the first of the year – it seems likely that regulations will be rolled out before a new law passed, giving the upstate casinos a head start vs. other gaming outlets. But those regulations may not be finalized anytime soon. If and when state lawmakers do get around to passing something, the New York sports betting market is expected to be be pretty huge.